One of the most renowned vampire films ever made is that of Nosferatu: A Symphony of Horror, directed by F. W. Murnau released in 1922. The film is between 81-94 minutes long, depending on the version you get, and is a silent, black and white film with titles and symphonic accompaniment. 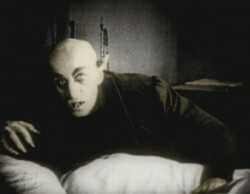 The film is appropriately named Nosferatu, a German word meaning ‘bird of death,’ as Murnau’s film was largely based on Bram Stoker’s novel Dracula, whose text makes the original connection between vampires and flying bats. In Slavic, however, the word nosferatu, or ‘nosufur-atu,’ means plague carrier. Whether intentional or not, Murnau’s film also plays off this meaning during the film and delves into the link between vampires and the plague. Murnau’s depiction of Count Orlock, the film’s vampire villain, is one of the reasons the film has drawn so much acclaim. Unlike Dracula, Count Orlock is portrayed as a more affecting character, alone and isolated, craving the affection of a woman he can never have, Ellen, the wife of the film’s hero. In the film, Ellen eventually discovers that only the blood of a woman pure in heart can kill a vampire. She then offers herself to Orlock, whose desire had brought him over the Atlantic Ocean. As he drains her blood, Orlock loses track of time and is killed instantly by the first rays of sunlight. Which brings us to another significant aspect of Murnau’s Nosferatu: it was the first portrayal of vampire death by sunlight in the history of vampire fiction (Dracula was killed by a knife). Although porphyria is often blamed as the reason vampires took on the characteristic of photosensitivity, this is the first account of sunlight as eradicating a vampire. 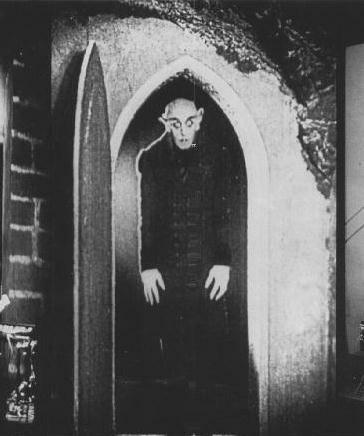 And thanks to Murnau’s Nosferatu, the sunlight-fearing characteristic has become a signature trait of the vampire. Other characteristics of the film that set it apart from other films of its day were the methods included in the editing and production of the film. Murnau used superimposed images, along with unique angles and the use of negative images to create an impressive Expressionist film. He strongly desired artistic control over a film, focusing on the particulars of scenery, lighting, and shadows to amplify the dark mood of the film. Murnau cherished his control so much, in fact, that he quit working for one studio when he felt he did not have the control he desired. Of course there are the obvious facts of the film as well. Murnau is known for his brazen reliance on Stoker’s Dracula without any intention of admitting or paying royalties for their plagiarism. Murnae and his producer, Albin Grau, were inevitably sued and the original negatives and prints of Nosferatu were destroyed. Fortunately, like many others have said, I must agree: In the end, a good vampire always prevails. In time, copies of the film surfaced, and since 1928, Nosferatu has been restored several times to the brilliant glory it deserves. If you haven’t seen it already, you need to check out one of the most influential vampire films of all time. Luckily, there’s a free copy of it on Youtube that has over 1.2 million views. Check it out, Nosferatu: A Symphony of Horror is a must-see for vampire fanatics. Just saying, you won’t regret it. “Noferatu” is not a german word that means “bird of death.” It is a word used in the novel DRACULA by Bram Stoker, which he got from a book of Romanian folk legends but was prior to that book’s publication unknown (is most likely a corruption of the greed “nosphoros”). I’ve read a few times it means “plague carrier” but I have never heard “bird of death” before. A very good film, some of the most impressive adaptation of Bram Stoker’s book, even if all names have changed. I used to have the luck to organize a live soundtrack for the movie, with a french darkfolk band called TAT, who wrote dedicated songs for the occasion. With some people involved on Vampirisme.com, we created a non-profit association few month ago (nearly a year now), to set events about vampire in France. Our first event was called “Le salon du vampire”, and the live soundtrack was the climax of the second day. If you want to have an ear at what TAT have made for the movie, some of the songs are on their Myspace : non-profit association (especially Warlike days are over).